The principles of lean manufacturing have become so widespread chances are you’ve heard something about them or are involved in some form of it. The idea is that one can divide their workforce into distinct processes or work cells that can be easily monitored. Companies with active Lean Manufacturing programs understand the need to map and measure every stage of their “Value Stream” for each product with the objective of eliminating waste from every process. LED displays quickly improve the effectiveness of any Lean Program by giving you the ability to post and broadcast these measurements where they are needed most. The latest release from our Automation Division is available in single- or double-sided configurations. What makes the Salescaster ANDON Display unique is its combination of screen configuration flexibility, system integration and ease-of-use. Ready for use from the factory, The Salescaster ANDON Display does not require custom proprietary protocols. Based on internet technology, the TCP/IP physical connection with Ethernet, integrates easily into any existing LAN infrastructure, and the client/server based ActiveX component easily integrates into existing HMI’s. For those programmers needing complete control of the sign’s operating system, a Software Developer’s Kit is included. The product provides complete details on how to use the included software libraries to talk to the sign hardware. Integrators are capable of writing custom applications, integrating to legacy protocols and much more. Run your HMI applications right on the AVPC so the entire shop floor can see the same screen, at the same time. Running GE Cimplicity©, RSView©, Wonderware©, Visual Plant©, Iconics© or other HMI or SCADA applications on the AVPC is as easy as running them on your desktop computer. Just resize your screen to match the display size of the Andon Board parameters. ANDON display configuration has never been easier or more flexible. 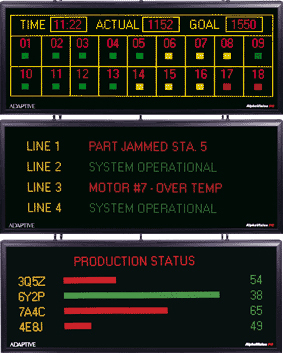 Rather than proprietary protocols, run your existing HMI on the AVPC to create your ANDON layouts. Display your HMI faults and alarms where everyone sees them immediately, utilizing the same applications you’ve created for shop floor operator interfaces. Full Matrix High Resolution LED Display with flexible configuration to accommodate your ever changing needs. .3″ (7.5mm) resolution for graphic and text applications. Hardware cost is competitive with older line matrix ANDON solutions. Long term cost is significantly reduced due to flexibility of the full matrix display and the open architecture. Supports industry standards – No custom protocols, so no complex development. Greatly reduce integration costs by using your existing software tools. Communicate safety awareness and production messages. Supplement ADA and safety program requirements. Display current production status reports. Report customer service problems as they are logged & resolved. Show quality and financial reports in both text and graphics.